There are so many things to do at Howarth Park that it’s hard to name them all. There is a 25-acre lake that is perfect for fishing and boating, or you can play on the softball field or on one of the six lighted tennis courts. For hiking, biking or jogging, there are miles of winding trails that connect with the scenic Bay Area Ridge Trail. 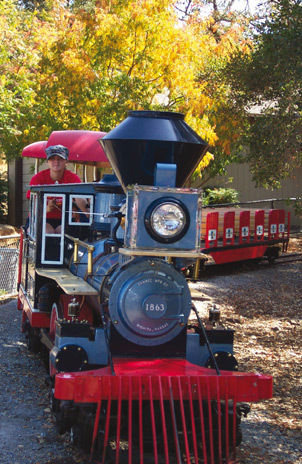 Ride a miniature train, take a spin on the carousel in the amusement area, or ride a pony in the animal farm. The simulated 1863 C.P. Huntington steam train takes guests on a quarter-mile train ride through the haunted tunnel, down to the pond where “Alfred the Alligator” lives, across the 100-year-old bridge and into the enchanted forest where Manny the Monkey likes to hang out! Children 12 months or younger may ride for free but must be accompanied by someone at least 16 years of age. Their whimsical carousel houses 30 horses, 2 chariots and over one thousand lights!